This evening I took another peak at T Pyx and was surprised to find it looking a bit fainter than it did last night. 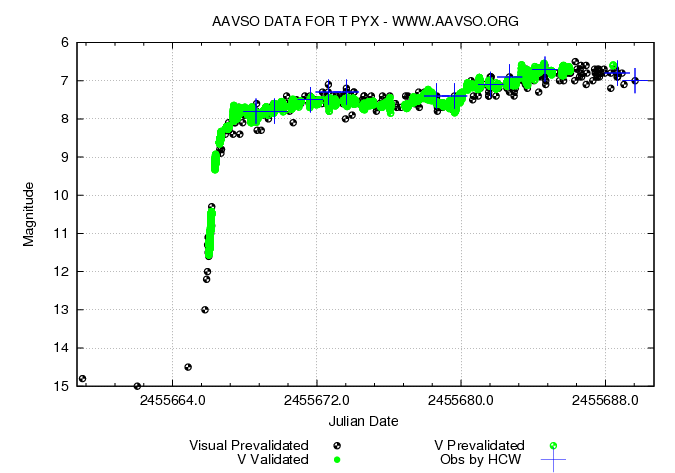 The lightcurve from the AAVSO suggests that T Pyx may have been slowly fading over the past 3 days or so. It will be interesting to see if this is a short-term dip before brightening to its predicted peak later this month, or if this is the beginning of a fade back to quiescence. Visual and CCD V lightcurve for T Pyx from the AAVSO LightCurve Generator. Credit: AAVSO.